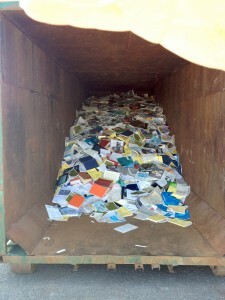 A dumpster at the Fisheries and Oceans Canada library in Mont-Joli, Quebec in an image sent by a federal union official. Source: Tyee. Where’s the data? What was removed from the Department of Fisheries and Oceans Libraries and Archives? The Department of Fisheries and Oceans (DFO) libraries contain one of the world’s most comprehensive collections of information on fisheries, aquatic sciences and nautical sciences. Canada encompasses the world’s largest coastline and roughly 18 per cent of the world’s surface freshwater. Canadian scientists have been crucial in collecting information on these ecosystems for decades. Yet, the consolidation of the DFO Science Libraries from eleven locations to four by the former federal government has severely impeded access to information for fishery and ocean communities. According to investigative journalists, many collections such as the Maurice Lamontagne Institute Library in Mont-Joli, Quebec ended up in dumpsters while others, such as Winnipeg’s historic Freshwater Institute Library, were scavenged by citizens, scientists and local environmental consultants. Scientists report that yet others were burned or went to landfills. See below for more information. We value the long-term data generated by Department of Fisheries and Oceans researchers. We are concerned about the loss of that data in the recent consolidation of DFO Science Libraries. Despite an affirmation on the DFO library website, which states that, “There has been no change to the size or scope of the collection” post-consolidation, there are numerous, separate, and validated accounts of individuals simply taking valuable data and records from closing libraries. What was taken out of these collections? The DFO has claimed that only “content not required to support the department’s mandate” was removed. Yet there is no indication of what that constitutes. What it is the value of the loss of this data in financial terms? What are the costs to scientific and historical knowledge? A publicly available list of the removed data is necessary for full accountability in this consolidation effort. I am writing this email as part of Write2Know (http://write2know.ca) a letter-writing campaign that aims to mobilize public awareness and inquiry into federal research programs. We want to let you know that we value federal research, and that our questions arise out of genuine concerns about the health and well-being of Canadians. Disclaimer: Any emails you send to a government email address potentially remain on file. Any contact information you provide, including your name, email address, IP address, and geographic location may be kept and used by the government institution you contact. Please enter your information in the fields below to send your letter. Click on “Read the Petition” if you would like to edit the letter before you send it. Erika Thorkelson, “Why is the Harper Administration Throwing Away Entire Libraries?” Huffington Post, 01/09/2014.